I wouldn’t be giving away any of the plot by telling you that the murderer confesses to his crime within the first twelve pages of this book. At which point I asked myself, “Why am I reading this? I already know who did it.” But, it was a sufficiently interesting enough ploy that I continued on…reading Grisham, as one does, for the story with legal ramifications. And, there’s another thing that impresses me: his use of faith. I first noticed it in The Testament, and I noticed it again here. Whole passages which are dedicated to the issue of belief, and if I may be blunt, Christianity. However, after witnessing the execution, Keith was a different person, or at least a different preacher. Suddenly, confronting social injustice was far more important than making his flock feel good each Sunday. He would begin hitting the issues, always from the Christian perspective and never from the politician’s, and if it rankled folks, too bad. He was tired of playing it safe. “Would Jesus witness an execution without trying to stop it?” he asked. “Would Jesus approve of laws that allow us to kill those who have killed?” The answer to both was no, and for a full hour, in the longest sermon of his career, Keith explained why not. The novel does not come across as a sermon. It is a very moving examination of the death penalty, of innocence and guilt, of police work gone wrong and laws which are worse. I found it very thought provoking, and I’ll be thinking about it for a long time to come. And you? Do you have an opinion on the death penalty? Or, on those who are to uphold the law and instead only uphold their own agenda? 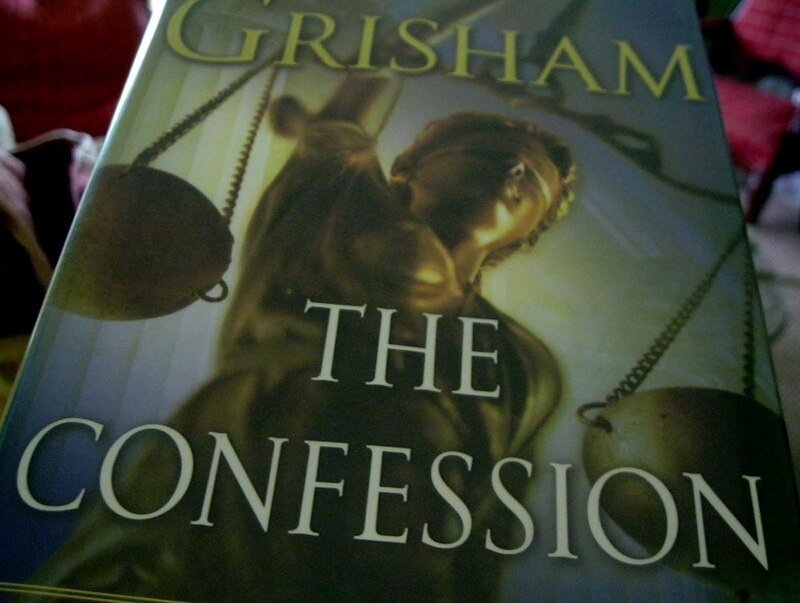 I haven't read any Grisham in a long time, but you've tempted me with this one. As for the death penalty? Frankly, it scares me. I don't like the idea of society sanctioning the taking of a life. I heard Grisham speak about this book and have wanted to read it ever since. Have you read Dead Man Walking by Helen Prejean? It will really make you think about the death penalty. Did you know that most of the people on death row were represented by public defenders? If you can afford a decent lawyer, you usually don't get sentenced to death. Bermudaonion, I had no idea about that statistic; how awful! Grisham ends this book with another death sentence victim, who had no one to claim his body. It was thrown into the prison morgue with the other unclaimed bodies who died from a death sentence. So tragic, that in many ways, the whole spiral starts with being unloved at home. In my opinion, anyway. JG has been very vocal in his view against the death penalty, as early as The Chamber (1994). I used to be a JG fan. I think I probably have read almost all of his legal thrillers. I must say though, I've enjoyed his earlier works than his more recent ones. I agree with you that he's been successful in weaving his faith and his view on the death penalty in his novels. Arti, I forgot about The Chamber. I've read all of his books except for The Bleachers (is that the name?) and they tend to blend together. But, like you said, his early ones were really the best. A Time To Kill had many issues, most of which I've forgotten now, unlike The Firm and other which just seemed written for the thrill. I'm glad you see the same emphasis on Christianity I do, that I'm not just imagining it. Not a fan of the death penalty, altho it's not an issue here, because of the amount of wrongful arrests you see through the media & also if murder is wrong on any level how is state murder any different?. On the book I don't know why, have only read one years ago & can't even remember which, but Grisham just doesn't appeal to me. I think I'll be one of the few who actually has very little problem with the idea of the death penalty. For one thing, the advances in forensic science makes the possibility of a man being wrongly convicted very low, and it seems to be the only sure way to be sure that some very dangerous people won't endanger public safety again. It also helps with overcrowding in prisons, meaning that the judicial system isn't forced to give criminals painfully short sentences. It's perhaps an extreme point of view to take, but it's still something I would agree with wholeheartedly in the right situation. Nisa, I can appreciate your point of view. Citizens financially supporting criminals doesn't seem like a very wise plan…if only we could overcome evil in this world! I agree with Nisa. Becca, I believe that it's not society that has sanctioned the death penalty but the Bible. One of the functions of government given to it by scripture is to protect the innocent and punish the evildoer. If someone takes a life, theirs should be given in exchange. I believe in restitution and not imprisonment. People should pay for their crimes in like manner. If you steal, pay back plus some. This is the biblical model. Debbie, I'm thinking about what you wrote, and here's my initial thought: I think the Old Testament adheres to 'an eye for an eye, a tooth for a tooth' kind of retribution. But, I think it was all changed in the New Testament. For example, consider this passage from Matthew 18: 21-22: " Then Peter came to Jesus and asked, “Lord, how many times shall I forgive my brother or sister who sins against me? Up to seven times?” 22 Jesus answered, “I tell you, not seven times, but seventy-seven times.I think we're clearly given the directions to forgive, and that, combined with "Thou shall not murder" make me feel the death penalty is wrong. It's not anything I could vote for, anyway; I don't want to bear that much responsibility for someone else's life. It's been a long long time since I've read a Grisham, but I've got a soft spot for his writing. He was my first "adult" author.